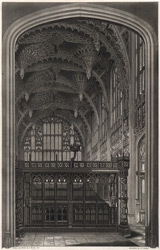 View of Henry VII's Chapel from the East End showing the elaborate carvings and magnificent ceiling. Henry VII was the fourth great Royal patron of the Abbey. He started a new chapel in 1503, intending it for his murdered uncle Henry VI. This costly venture was scaled down; however the finished chapel was still impressive with its delicate fan-vaulted ceiling and magnificent monument erected over Henry VII's tomb. Tudor and Stuart descendents were buried in the Chapel.